When you think of a first-class gaming experience, mobile gaming is not usually what comes to mind. There have been quite a few really fantastic mobile games, but most are just for a quick gaming session, with very few offerings for the serious gamer. If you’re into serious gaming or eSports, you’re probably going to be on a powerful PC or console. 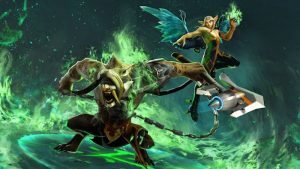 Vainglory looks to change the face of mobile gaming with a massively multiplayer experience and an up-and-coming eSport focus. Does it’s gameplay live up to its ambition? Let’s take a look. Vainglory is a MOBA, which stands for Multiplayer Online Battle Arena. The basic idea is there are two teams made up of three players each, and each team is trying to destroy the others base. To do this, they need to travel down a center lane and destroy giant turret guns protecting the enemy’s base. There is a constant stream of minions pouring out of each base that will do little more than distract the enemy. It takes teamwork, quick thinking, and powerful hero skills to win the battle. Vainglory is a big game with lots of moving parts and many things to learn before you can just jump in. To help with the otherwise steep learning curve, the game walks you through several tutorial missions that cover everything from basic movements and maneuvers, several different special abilities, unlocking heroes, and some light strategy to help you win. All of this takes about an hour, but it’s worth your time to really understand all of the things going on in battle, as they can get quite fast-paced. To really get the most out of the game, you need to create a profile to be able to access all the features and events. At the time of this writing, there’s a tournament coming up where you could win an iPhone 7, so we’re not just talking about in-game currency or a unique character, but actual real life prizes. There’s also an active community, friends list, and even an eSport league, so when it asks if you want to register, do it. The gameplay is solid and really easy once you’ve learned how to play. There are around 30 different heroes to choose from, each with multiple unique abilities, so playing around with all of them is key to discovering which characters skills fit your play style. I’m partial to Saw and his giant minigun, but there are quick run-and-gun characters, sword wielders who get up close and personal, and even little mage dragons who look like they came right out of Digimon. No matter your playstyle, there’s something for everyone. Each week there are new free-to-try heroes, which can be unlocked through collecting in-game objects or can be purchased through in-app purchases, so if there’s someone you really like, you can have them available, but for me personally, I enjoy playing with all of the different character types and trying them out for the week. If during that time there is a character that you especially like, you can purchase them for 10% off their regular price, which is a great system. Depending on your match type, each round could take anywhere from 5 minutes up to 30+ minutes. At the start of each round, you have a small amount of money to buy one piece of equipment with, but as you mow down minions and enemy heroes, you’ll gradually gain both gold and experience. Gold can be use at your base or as item shops on the battlefield to purchase new equipment that will increase your attack, defense, speed, or grant new abilities, such as short speed bursts. Experience allows you to upgrade abilities and unlock new abilities for the round. Each round starts you off with little equipment and gold, allowing you to rebuild in different ways depending on what is needed for the round. If a certain enemy is resilient to your first ability but crumbles against your second, you can tailor your build during that game to boost the damage and level of your second ability. There’s also gameplay modes that will start your character at level 4 with a good sum of gold from the start so you can jump right into the action. 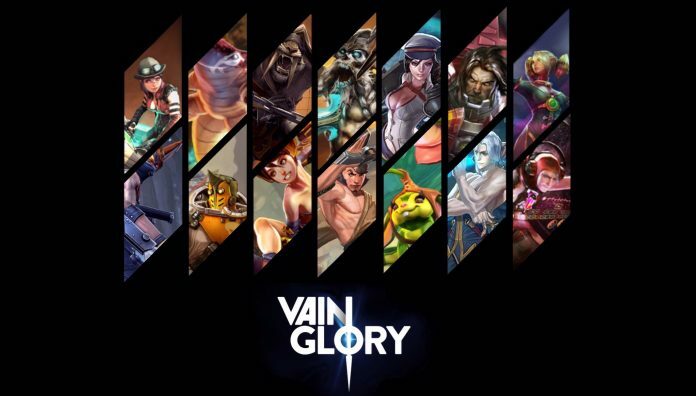 The biggest draw to Vainglory is the fact that the game is centered around multiplayer. There are some bot modes to play but they are just considered practice rounds, and your AI controlled allies can pretty much be forgotten about because they will be off lollygagging about and will not be much help. Connecting to other players and working together to overthrow the other team is the heart and soul of this game, and when you find players that you play well with, the game really shines. A strong team usually consists of characters that can cover each other weaknesses, but I’ve played matches where my teammates and I overwhelmed the other team through sheer force alone. The variety of character you’ll be playing with, both on your team and against, always keeps matches fresh and fun. This game is beautiful. There are brilliant colors everywhere on the battlefield. All around you are lush bushes, pathways that have been trampled by war, and incredible masonry surrounding each base. Character animation is smooth and using abilities is fun with leaps and dives and uppercuts that all transition seamlessly into one another. All the characters have unique looks and multiple costumes. 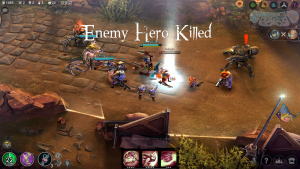 Vainglory is all the fun of the MOBA games on PC only in a pocket format. The characters are varied and unique, and with a heavy focus on multiplayer and events, there’s always new content to discover. In-app purchases are available but hardly necessary, which is great for those who want things right away and don’t mind paying, but it’s also great too for those on a budget. If you are a fan of MOBAs, action games, or enjoy serious gaming on the go, download this now. Vainglory is a beautiful game with loads of content, an active and exciting community, and big events. With an increasing focus on becoming an eSport game, Vainglory is must-play game for all video game (and especially MOBA) enthusiasts.